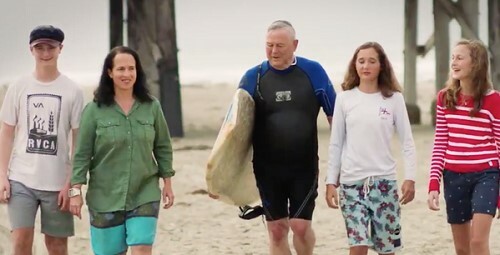 “CA-48: Incumbent Rep. Dana Rohrabacher (R-CA-48) now has a two point lead in this Orange County district over his Democrat challenger, Harley Rouda, in a poll released by Monmouth University last week. While still a statistical tie, a poll earlier this month showed the two candidates in a dead heat, 48 percent to 48 percent. I just talked with Dana last night. He is one of my oldest and dearest friends, bonding when we were in Youth for Reagan during the Gipper’s original campaign for California Governor in 1966, 52 years ago. When Dana was in the White House as Special Assistant to the President and one his key speechwriters for all 8 years of the Reagan Presidency (1981-1988), I worked closely with him to create the “Reagan Doctrine” of support for Anti-Communist Freedom Fighters throughout the Soviet Colonial Empire that resulted in the collapse and extinction of the Soviet Union as a nation-state. At the end of President Reagan’s second term in 1988, Dana was elected to Congress. Which brings me to a short story. Shocked, the professor stammered, “Are you sure, Cadet Wheeler?” Brandon answered, “Yes, professor. I’ve known Dana all my life. Pictures like this are all over my father’s study. 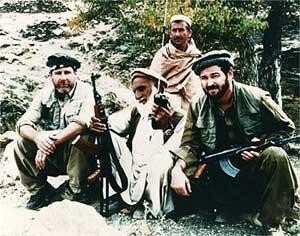 This particular picture is framed on the wall of Dana’s office on Capitol Hill. And I recognize my own father.” It was a pretty funny moment. Despite the unending smears of the Democrats, however, Dana has won reelection resoundingly fourteen times, only once below 55% of the vote (53% in 2008). 2016 was a typical Dana landslide victory of 58.3%. This year, however, is as you well know, different as light to dark. 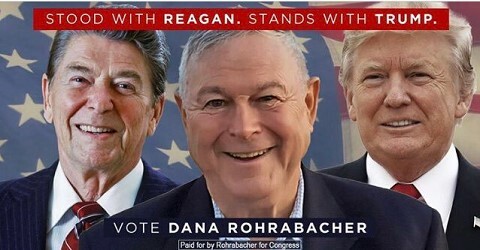 The Left has always hated Dana for his key role in getting rid of their idol, the Soviet Union, for being so unapologetically conservative across the board – for 30 years the ACU Ratings of Congress has given him a well over 90% conservative score (latest ranking 94.42%) – and now so totally pro-MAGA. The difference is that this year, the Left and the Dems have been pouring money into the campaign of Dana’s opponent, a carpetbagger from Columbus, Ohio named Harley Rouda, Jr. His father, Rouda, Sr., was a self-made entrepreneur who built a very successful business from scratch (HER Realtors in Ohio). Harley, Jr. is an all too-typical child of inherited wealth, who having never earned his money resents and apologizes for it by embracing socialist-fascist anti-capitalist left wing causes and politics. So he moved to California and is trying to buy a seat in Congress and join Nancy Pelosi in trashing America. As reported by Breitbart (10/12), Rouda supports every far-left position there is, open borders, amnesty for illegals, sanctuary cities, pro-abortion, the entire Pelosi-Bernie-Antifa agenda. So far, Dana’s popularity has been able to fend Rouda off. But just now, radical left-wing billionaires have suddenly flooded Rouda’s campaign coffers with millions. On October 25. The Orange County Register reported that Billionaire Michael Bloomberg Spends $4 Million to Back Rouda and Defeat Rohrabacher, Making CA-48 the Priciest House Race in the US. Almost 80% of the $18 million-cost of the race comes from radical lefties like Bloomberg and Soros to defeat Dana. Dana can fight back and triumph, but he needs our help to do so. I am maxxing out my donation to Dana’s campaign, and I am asking you to do so to whatever extent you can. I am asking not simply because Dana is my friend for over a half-century, but because you can help save the House from the Pelosi-Antifa Mobs-Not-Jobs Democrats. Here is Dana’s Campaign Site. Here is Dana’s Donation Page. Please, please try to send him however much you can. Every dime will go straight to countering the Soros-Bloomberg assault on him. He needs this now, as in right now with November 6 just six days away. Time is of the absolute essence. You must do what you can today – today! – to help save the House. That includes forwarding this message to everyone you know! Oh, one last point. Should Dana win and the House saved, he will be Chairman of the House Science Committee. That means he will be the key in the House to advance President Trump’s science agenda from getting the Dems’ fascist EPA and Warmist agenda out of the way of the Trump Boom Economy to the President’s Space Force and the commercialization of space with fantastic economic potential. We can do this. So without further adieu, go to Dana’s Donation Page or call your bank, and do what you can. It’s not just Dana or me who will thank you. It will be America.